When I was asked if I’d be interesting in reviewing the latest selection from Matcha Chocolat, I nearly bit Katie’s arm off. I’m a big fan of Katie Christoffers and the wonderful tea based chocolates that she produces. 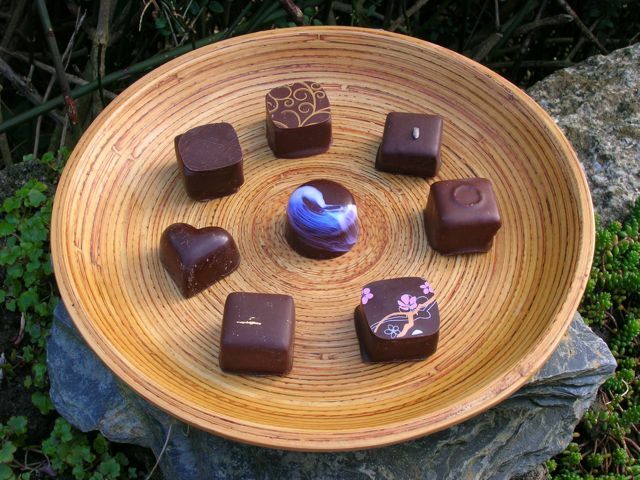 Since she started making fresh artisan chocolates two years ago, she’s been going from strength to strength and has won several prestigious awards. From her tea theme she has gone on to develop a range of other chocolates all inspired by various fruit, flowers, herbs and spices from around the world. Earl Grey – ganache made with 64% dark chocolate from Madagascar and enrobed in dark chocolate. It has an aroma and taste of strong dark chocolate with subtle notes of Earl Grey. This takes a while to come through, but also takes a while to leave. It has a slight smokiness and a citrussy note with the smooth unctuous creaminess I associate with Matcha Chocolat. Delicious. Pink Grapefruit (Great Taste Award Winner) – ganache made with a mix of Madagascan 64% and Santo Domingo 67% dark chocolate. This uses real pink grapefruit juice and you can tell – it tastes of fruit rather than a chemical. CT has a horror of commercial citrus chocolate which makes him feel nauseous, but he was fine with this one. It has a slight bitterness associated with grapefruit pith and tastes of the fruit, but not overwhelmingly so – Katie has matched this well. I loved the appearance of this one too, with what looks like a cherry blossom motif on top. Tonka Bean Caramel – Covered in dark 64% Venezuelan chocolate, this caramel has a butterscotch flavour with a touch of bitterness that stops it being too sweet. This one was particularly intriguing as neither of us had the foggiest what a tonka been is meant to taste like and this made it hard to identify the flavours. It was distinctive, with a slight floral tone and won’t be forgotten in a hurry. It seems most unusual to combine salted caramel with these sorts of flavours, but it works. Passion Fruit – Venezuelan 49% milk blended with 64% Madagascan dark chocolate, this ganache is covered in milk chocolate. Although we both love the fruit, we’ve had bad experiences of passion fruit flavoured goods in the past; normally, it drowns everything else out with its artificial brashness. It was thus with some interest that we bit into this one, wondering if Katie had managed to pull it off. Yes she has; it tastes like real passionfruit rather than a real passion killer. The flavour is fruity to begin with, but difficult to identify. As it goes on, however, the passionfruit comes through with its lovely tart, aromatic quality. Los Ancones – 67% dark chocolate ganache from the Los Ancones plantation in Santo Domingo. Wow, this packed a powerful punch with its robust, rich, strong chocolate flavour. I tasted notes of toffee, but boy did it make the taste buds zing. No elegance or gentleness here, despite the gold leaf decorating the top, its not in the least bit subtle; CT remarked it was akin to drinking strong black coffee after a heavy night out – a real theobromine hit. But oh so creamy! Hazelnut & Cinnamon – 64% dark Venezuelan chocolate. This was the only one where we detected an aroma other than chocolate before biting into it. CT detected hazelnut, I detected cinnamon – together we got it right! There were lots of oohs, and ahhs going on with this one. Softly crunchy, the taste of hazelnut emerged first then came the cinnamon which ultimately becomes dominant – two for the price of one. It was delicious with a surprise texture, very different to the others due to its crunchy wafers. As CT, between grunts of satisfaction put it, “it’s alchemy, that’s what it is – Katie the alchemist”. Salt is also included and enhances the tastes of the others to brilliant effect. Lavender & Vanilla – A mix of 49% Venezuelan milk and 64% dark Venezuelan. This had a strong aroma of lavender from the calyx on the top. Initially it tasted of mild mint, which was delicious if rather unexpected. We put it down to the ameliorating influence of vanilla. But when we bit into the calyx the strong bitter taste of lavender kicked in and overpowered the rest; it would have been better without it and should have come with a warning sign! Masala Chai Caramel (Great Taste Award Winner) – Venezuelan dark chocolate housing my favourite caramel, but in a rather different form. This is beautifully and strikingly decorated with its blue swirl around one side. The liquid spiced caramel has cardamom to the fore and it just as good as I remember it – pure decadence. The ultimate comfort food reckoned CT and a couple of those after a hard day would beat any glass of wine. They were all absolutely exquisite. They were also very satisfying, tasting of real chocolate and real things. The only quibble we had was the bit of lavender which would have been better if removed before eating. You can tell Katie is a true artisan by the good balancing of flavours and I suspect must spend a considerable time perfecting her recipes. She is a master chocolatier and richly deserves the reputation she is building up and the awards she has won. There were two that stood out for us though. CTs favourite was the Hazelnut & Cinnamon Feullantine and this was mine too – until I got to the Masala Chai Caramel, which I think topped it, just a bit! You are killing me with this post! I want that pink grapefruit one so bad!!! Masala chai, masala chai, masala chai… If I keep wishing really, really hard surely they might appear before me? Oh you know how much I love chocolate and it has to be really good chocolate and these look and sound like really good chocolate. I must drop hints to Mr OC. Oh do drop hints, these really are good chocolates and very reasonably priced for what they are! How lucky you are to have had Katie’s chocolates! When I was in London, she had sent some to me, but they didn’t arrive at my hotel in time. Hopefully, I’ll make my way back to the UK soon. They sound amazing! I must get my hands on some pronto! My last chocolate tasting and making was great fun but not as highbrow! Helen, I so want to go on a chocolate making course. I need to show this to my husband……no I shouldn’t.. he’ll eat the computer screen. LUCKY LUCKY LUCKY you! What an amazing selection of chocolates, and all flavours that would tempt me, never mind my mum! You make me want to try these super cute chocolates. Hope to have some when I visit UK. Oh my they are so beautiful with their use of colours – wow!